The Observation Play is a commercial playground structure that would be suitable in virtually any outdoor space, including schools, church communities, business parks and hospitality and tourism locations. It can entertain as many as 35 children in both the 2 to 5 and 5 to 12 age groups with any of its 9 play activities. Children love the challenge of using the Apex Climbing Link to move from one deck of the playground to the other. 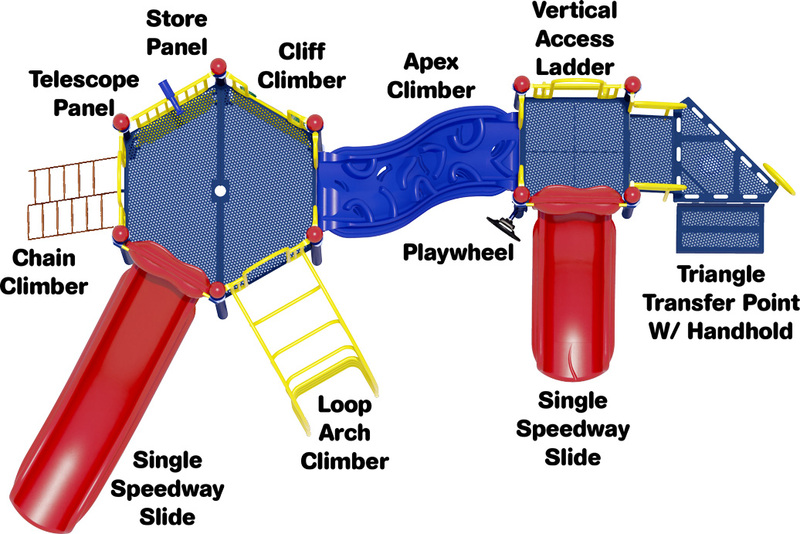 Two Single Speedway Slides allow children to enjoy a safe but rapid slide to the bottom of the playground structure. The Loop Arch Climber provides a spatially challenging climb that helps children develop balance, coordination and visual acuity. The structure is constructed from lead-free polyethylene coated punched steel decks, 3.5"O.D. galvanized 12 gauge posts, UV stabilized rotationally molded plastic components, and high-density polyethylene activity panels. Posts are powder-coated to customer color specifications, and are backed by a Lifetime Limited Warranty. All plastic components and decks come with a 15 year limited warranty. The metal pipes, rungs, loops, and rails associated with climbers come backed by a 50 year limited warranty. 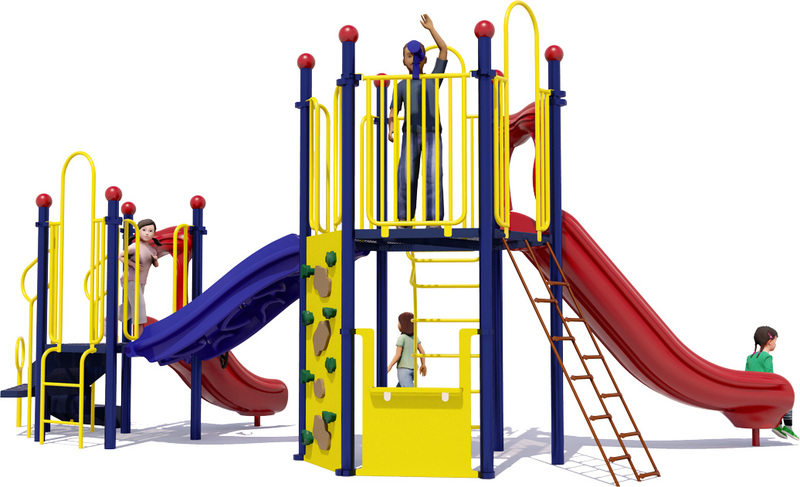 The commercial playground equipment is ADA accessible, and meets or exceeds all requirements from the American Society for Testing and Material (ASTM) and Consumer Product Safety Commission (CPSC). 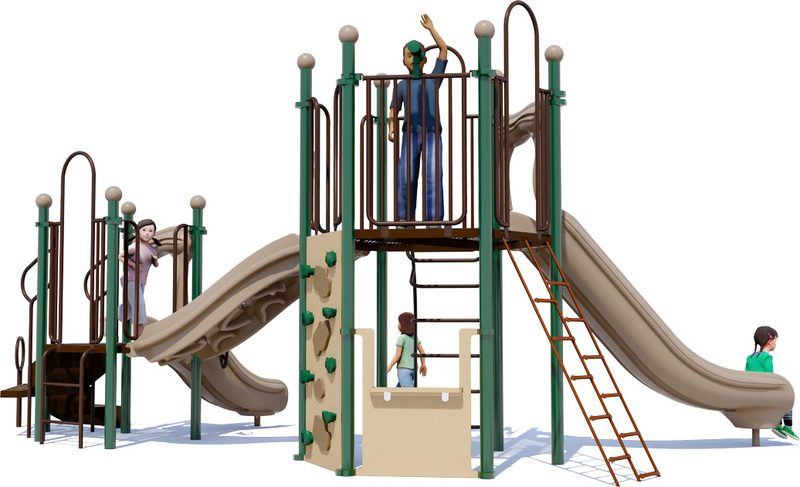 American Parks Company is a national leader in playground and park equipment, site furnishings and customer support. We will help you plan, build and install your ideal playground solution on budget, and have experience building playgrounds that last, coast to coast. Contact one of our playground specialists for more information: 1-800-381-4491. 2 Slides, 1 Apex Climbing Link, 1 Telescope Panel, And More!